Heat oven to 350°F. In small bowl, mix butter, parsley, garlic and 2 tablespoons of the chives; set aside. Bake French loaf as directed on can. Cool 5 minutes; cut into 12 (1-inch) slices. Spread butter mixture on one side of each slice. While bread is baking, in 10-inch skillet, heat oil over medium heat. Add beef; cook 8 to 10 minutes, stirring occasionally, until thoroughly cooked; drain. Stir in chiles, reserved chile liquid, chili powder, tomato sauce, jam, mustard, salt and pepper; heat to simmering. Reduce heat to low; cover and cook 5 minutes. 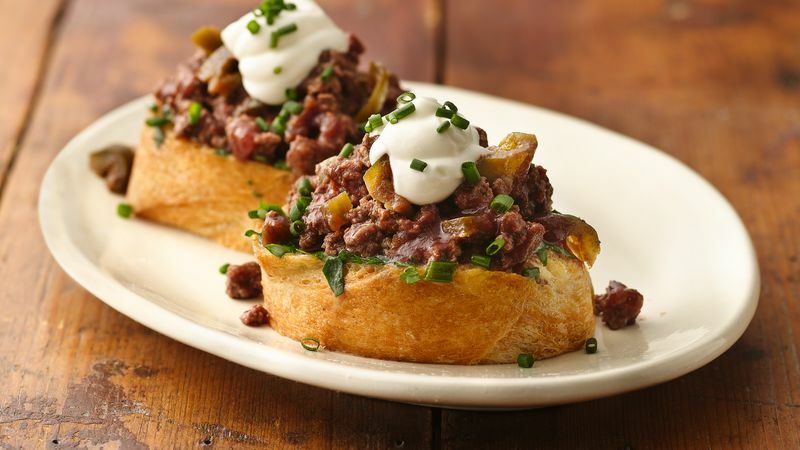 For each serving, place 2 bread slices on each plate; top each slice with heaping 1/4 cup beef mixture, dollop of sour cream and some of remaining chives.